Sematext Cloud, our real-time analytics and data visualization IT enterprise platform for logs and application metrics, is designed to make the dashboarding powerful feature for cohesive data analysis, and for easy navigation and customization of devops or business dashboard reports. Index data from virtually any source, format or location, search and analyze it, and monitor your applications and infrastructure stack with ability to generate dashboard(s) from all these pieces, usually disconnected parts of IT puzzle. Combine them together and use dashboarding as powerful analytics and presentation tool. Dashboards provide helpful views of KPIs (key performance indicators) and consist of multiple visualization components which can accumulate data from multiple data sources such as logs, metrics, and events into one centralized pane of observability glass. You can create goal specific reports with various metrics visualized, and share them in a meeting to show what that data says about your business. On the other hand, logs data is hard to analize and can be extremely tedious to understand. Dashboards provide means to bring together one or more metrics reports together with logs reports, and display them in a unified report view for easy correlation and investigation. Dashboards help you get visual view of operations happening in you environment and often play key role in decision making. Register for free or Login into Sematext IT enterprise systems monitoring platform to get started and create various dashboards reports from your logs or monitoring applications. Make it indispensable tool to search and investigate logs data while having relevant metrics and performance KPIs available in one place, in a single pane of glass. Your devops team will be able to quickly respond to service failures and minimize downtime, proactively use dashboarding to identify performance issues before the user experience is affected, and pinpoint the root cause of the problem and focus on fixing rather than investigating your IT infrastructure and application issues. Image bellow shows already created Dashboards Report identifying section's top navigation elements and active app section in the left sidebar navigation. We are using it to monitor the health of our cloud based application performance monitoring platform. It is made up of several different technologies used in our stack, namely HBase, Kafka, and MySql, and for each piece of tech in the stack a monitoring application has been created. Check Integrations pages for more details on available monitoring integrations. 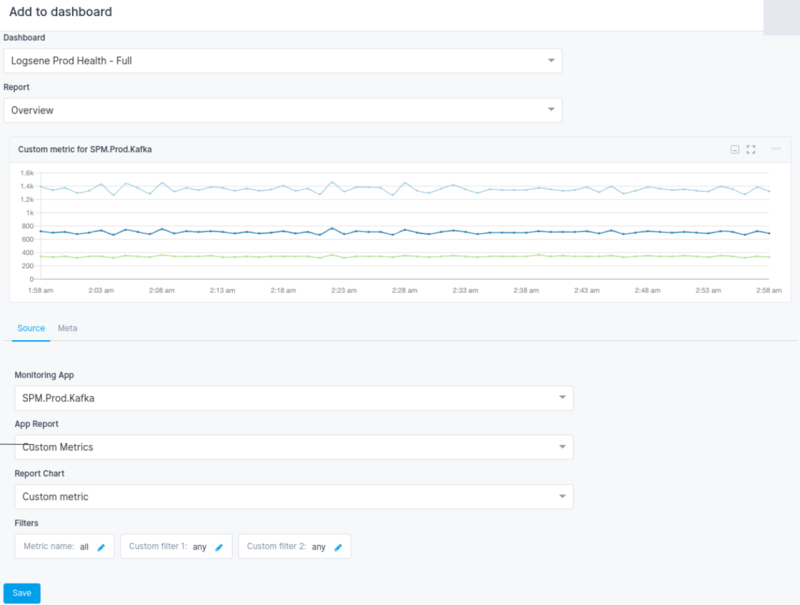 Each monitoring app comes with out of box metrics components that are carefully crafted to give you instant insight into the most important and relevant metrics for that particular technology. 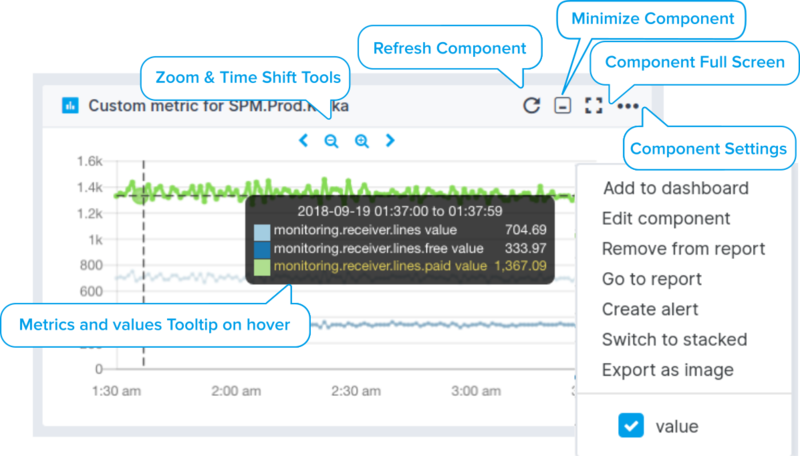 For example, an Elasticsearch monitoring app will have cluster health, index stats, nodes, request rate, cache, jvm pool size, latency, connections, documents, and more metrics components displayed as report components, and available as soon as installed Sematext agent starts sending your app's metrics. Check out infrastructure monitoring pages to learn how to create monitoring app and set up a monitoring agent. Image bellow shows a common monitoring app report component showing its functionality and interactive elements. 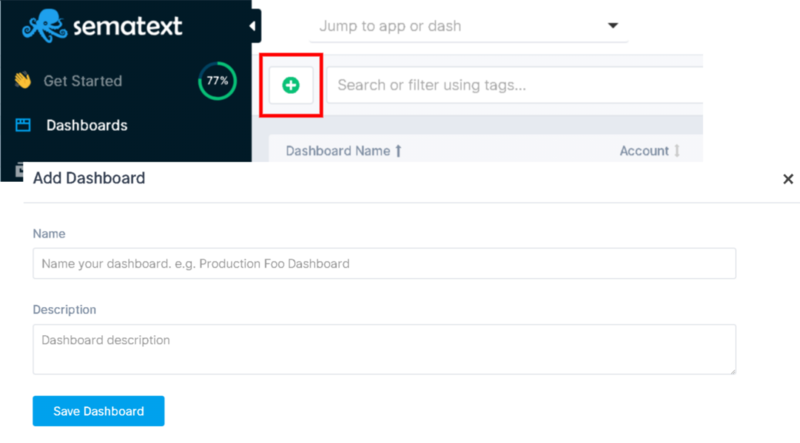 Using component settings dropdown menu, you can easily add any metrics components from one or more apps to a dashboard. Create your stack correlations reports and observe and analyze how multiple technologies coexist in your IT ecosystem. Zoom and time shift through charts, display single component in full view, create alerts, and effortlessly share reports across your organization. Just like monitoring app, logs app comes with pre build logging report components, namely Log Table component and Logs count histogram component. Use dropdown settings menu to add logs components to your dashboards, and combine them with metrics ones for full observability of your IT stack. Our tools will help your devops team find common exceptions, detect patterns in behaviours, and solve performance issues and availability problems. Any logging or metric report component can be easily added to one or more dashboards. First create a dashboard. Navigate to dashboards section and click on the add new button. Name your dashboard and further describe it using description field. Once you have a dashboard created, you can start adding components to it. At least one or more monitoring or logging application needs to be created. As soon as your data is consumed and indexed by our cloud service, both logs and metric components will become available for dashboarding. Moreover, with our custom reports features you can first create specific logging, events or metric component, and add it to your dashboard just as you can with out of box integration specific components that come included when you first create an app. Image below shows a custom Kafka report panel that was created by our devops team, and illustrates what will be displayed in a modal window when you add a component to a dashboard using components settings dropdown menu. Both custom and out of box components are available and they can be logging, metrics or events in nature. 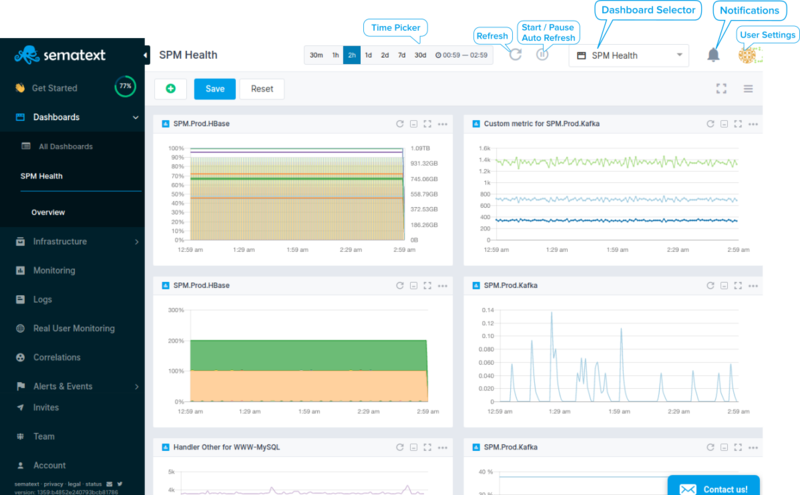 Monitor health of your whole application and infrastructure stack using our Cloud service, and easily navigate between dashboards and logs and monitoring apps. Add new components to your dashboards just as you can add out of box components available for over 40 different integrations. Register for free or Login. Create various dashboards reports from your logs or monitoring applications. Make it indispensable tool to search and investigate logs data while having relevant metrics and performance KPIs available in one place, in a single pane of glass.